Located in the geographical center of Argentina, the Sierras offer a diverse mix of both outdoorsy and cultural attractions. The Sierras may not compare to the Andes in terms of altitude, but they are rich in Argentine history, culture, and wildlife. One of the most sought after sights is that of the high flying Andean Condor, and our first hike listed guarantees a view into the life of these sacred creatures. Situated in the west side of Cordoba, and amidst the central Sierras Grandes de Cordoba mountain chain, is the Parque Nacional Quebrada del Condorito. Following Ruta de las Altas Cumbres, also known as Provinical Rotue 24, will lead straight to this highly protected area where exciting trekking adventures and condor sight-seeing opportunities are plentiful. Here it is easy to spot the largest flying land bird in the western hemisphere – the condor. Quebrada del Condorito is one of the most recently established National Parks in Argentina and has some moderately difficult trekking slopes. It does not require a high skill level to trek within this Park but good resistance is helpful. This trek can be done with a guide, but if you prefer to go at it individually, it is just as easy to jump on a bus from Cordoba right to the entrance. Going guideless may be beneficial for those individuals whose resistance is not as strong because they will be able to set the pace of the hike. 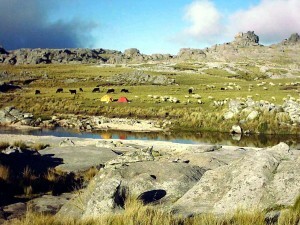 A 5 mile trek to the “Balcon de los Condores” will take about 7 hours. Condors swarm high above, and their massive size and noteworthy wingspan can be admired at the many stops along the way. The trek comes to an end when their enormous nests come into view. These dry lands can get hot so make sure to bring plenty of water, and to avoid extreme temperatures plan your trekking adventure from April to November. Emblase Cruz del Eje is a small town in the Cordoba province well known as a hiking destination and a beautiful landmark. Three hours are generally needed to arrive in this town from the main bus terminal in Cordoba. An additional three to four hours are generally needed to reach the Cross at the end of the 6km trek to the lookout that gives the town its name. This trek is one that can be done solo or with a guide. One major advantage of hiring a guide on this trek is to hear about all of the history in the area; but regardless of which method chosen it would be impossible to not enjoy. The first half of the hike is fairly steep and demanding. 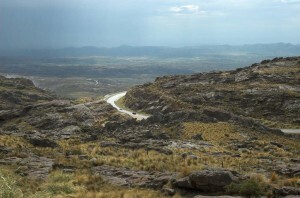 It passes by the town of Capilla del Monte and el penon del Uritorco. Any weary hikers or tired legs will be thankful when they reach the mid way point, marked with an old stone house in the middle of the plains. Take a second to soak it in because the second half of the trail to the peak of Uritorco will take your breath away- in more than one sense. At the very end of the hike the trail breaks off and visitors can choose their preferred route of reaching the top. At this point in the adventure many may be happiest taking the least demanding of the trail options, and they will appreciate knowing that the trail marked with white paint is just what they are looking for. The white paint leads the weary along the path with the lowest level of difficulty. Moments later, from the highest point on the mountain, the well known Cross of Eje will come into view, revealing the fascinating sites beyond and over the entire area. The trek is a tiring one, but the reward at the top makes it well worth the effort. Last but certainly not least is the Sierra de las Quijadas National Park – one of the most popular trekking sites in the San Luis area. It offers multiple circuits of low difficulty which enable every traveler to experience unique surroundings and archeological history. Perhaps this park is less trendy than others in Argentina is due to the difficulty in arriving at the site. The hard part is finding transportation, but once this is done it is a breeze, and well worth the trip. So to make it easy, hire a car. From San Luis, simply follow Ruta Nacional N147 for 120km and it will lead straight to the entrance of the 370,600 acre park at Hualtaran. 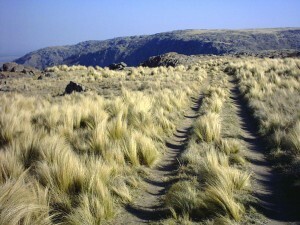 A maze of trekking circuits can be followed from there which weave through the numerous highlights and scenery. One of the more popular circuits leads to a highlight of the park…dinosaur tracks! La Huella de Dinosaurio, or Dinosaur Footprint, is an easy two hour trek that leaves a big impression…literally. Look-out spots known as miraradores are scattered along the way where trekkers can take a break and marvel at the panoramic views and unique features that are contained within the red walls. Two dinosaur specimens have marked their place in history with their prehistoric tracks and fossils. If this isn’t enough, continuing along the path will lead to the massive red rock walls of Potrero de la Aguada, mineral crystallizations, paleontology deposits, and 200 meter high crags. The park is a one of a kind spectacle that every level of trekker can enjoy and it and should not be missed. This page rendered in 0.406 seconds.